Georgeous turn key home with bright and open layout. This home features 3 bedrooms and 2 full bathrooms. This home is seated on a great size lot of 7560 sqft and 1627 living square feet and great size garage of approx. 492 square feet. The remodeled kitchen includes custom cabinets, stainless steel appliances, and sparkling quartz counter tops with bar seating. Bonus features are oversized bedroom, laminate floors, recess lighting, dual paned windows, rv parking, large garage with drywall and wood like ceramic title, block walls, and a good size backyard with fountain. 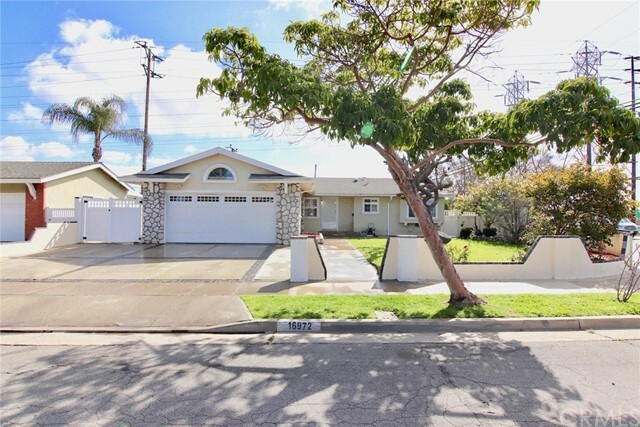 Corner lot home that is close to shopping centers, entertainments, schools, freeways, and a short drive to the beach. Huntington beach union high school district: ocean view high school, vista view middle school, and westmont elementary school. Must see! For more information or make an appointment to see property ID PW19070282.